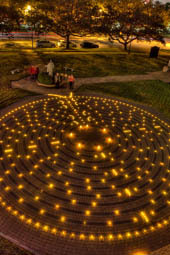 Labyrinth excitement around the globe is growing in anticipation of the 18th Annual Gathering of the Labyrinth Society, in the heart of Houston's Museum District at St. Paul's United Methodist Church. You will not want to miss this uniquely urban experience with over 20 labyrinths in the Houston metropolitan area. Register here. In addition to the many journeys we will travel together through the amazing facilitation of our speakers, presentations, and workshops, the Houston Museum District offers profound sacred places for us to explore. First, as you look at pictures of our majestic setting, take note of St. Paul’s United Methodist Church’s vision statement, “To be a cathedral for Houston that embodies its diversity, inspires faith, and leads change for the common good of all peoples and communities." How complimentary this vision is to The Labyrinth Society’s vision and, yes, a beautiful outdoor labyrinth awaits us! We will have to carve out time for the Houston Museum District "...whose mission is dedicated to collaborative efforts that maximize use of the artistic, scientific and educational resources of Houston Museum District institutions by all citizens of and visitors to Houston. Decision-making as to where to visit will be its own labyrinthine journey. Here are four suggestions of 19 museums from which to choose. Labyrinth builders may find inspiration at the Houston Center for Contemporary Craft, a nonprofit arts organization founded to advance education about the process, product, and history of craft. Another choice is The Jung Center. The center offers more than 200 classes each year on topics ranging from relationships to ethics, religious studies to expressive arts, and writing to meditation. In addition to gifts and cards, the bookstore includes the most complete collection of books on depth psychology in the Southwest. A most appropriate choice for our Gathering would be the Rothko Chapel. "The mission of the Rothko Chapel is to inspire people to action through art and contemplation, to nurture reverence for the highest aspirations of humanity, and to provide a forum to explore matters of worldwide concern." Then, there is the Houston Museum of African American Culture (HMAAC) that explores stories inspired by themes of opportunity, empowerment, creativity, innovation, and cultural interrelationships through the lens of the African American experience. In closing, all that is most essential to the Self and to the Community is found within the labyrinth structure. Walking a labyrinth reveals the dark and the light; the seen and the concealed; the loneliness and the connection; the fear and the security; the defense and the openness; the battle and the peace; the struggle and the rest. 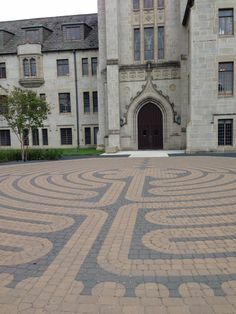 Perhaps, the common in the diverse is that the workings of the labyrinth come not only to the individual Self but also culturally in context to any diverse community. May we truly build community and life-long memories as we gather for the 18th time in freedom to listen, learn, and love anew!